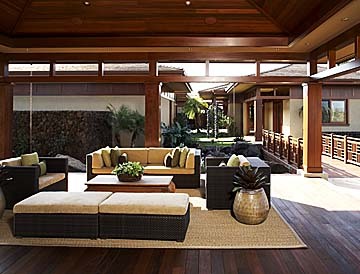 A luxury estate on the Big Island offers up an entertainment pavilion for its guests. W Interior submitted the home design for consideration for the American Society of Interior Designers Hawaii Chapter's 2007 Large Residence Award of Honor. It placed first out of nine entries for the award. Little grass shack or castle fit for a king? How you define your dream home is up to you; size is just one of the qualities to factor in when making a personal interpretation of such a sanctuary. Whether your home measures 400 square feet or 4,000, your residence has unique attributes to play up. As members of the American Society of Interior Designers Hawaii Chapter submit application packages in consideration for the 2008 Design Excellence Awards, two 2007 designers share details on their winning designs and strategies for making the most of a space, whether for a humble abode or stately manor. The pavilion in use during a reception. Of the 29 designs submitted overall last year, judges based their consideration on criteria such as spatial planning, problem solving, creativity, scale and proportion, comfort and aesthetics. All members of ASID may submit applications; winners of the 2008 Design Excellence Awards will be announced in September. 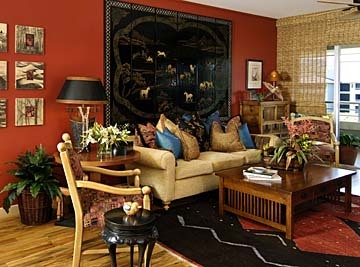 As the winner of the 2007 ASID Small Residence Award of Honor, Suzanne Watkins of Elements Design Group united her client's space with bold colors, pine flooring and a variety of textures. 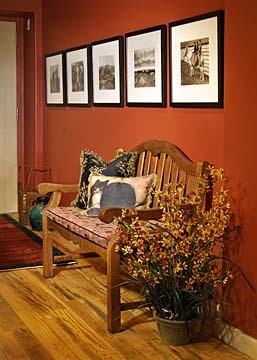 Watkins also used some of client's existing furniture in new ways, such as moving a forgotten bench indoors. 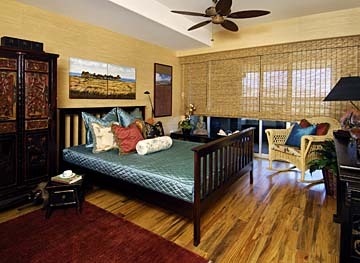 Suzanne Watkins moved her client back into the master bedroom upon project completion. The owner had been using a spare room as a makeshift bedroom. Suzanne Watkins, owner of Elements Design Group, has designed the interior of numerous commercial projects and residences, but nothing could inspire the Oahu-based designer more than the opportunity to work a bit of green design into a project. When a client sought Watkins' help in organizing her Hawaii Kai condo, Watkins steered her toward the idea of "smart selection." The interior designer kept existing furniture such as wooden end tables and coffee tables, some of which were antiques, while old carpeting was removed and replaced with recycled wood flooring. Watkins also replaced synthetic fabrics with pesticide-free organic cotton, a fabric which might be costly in the short run but leaves a smaller carbon footprint, she said. "I was very interested in green design before it became fashionable. It's part of the philosophy to downsize McMansions," said Watkins, an interior decorator for more than 30 years. "You evaluate how to use things in their most optimum manner." Watkins looked at the lifestyle of her client, a single professional who seldom cooked at home or entertained, and her property that included a bedroom, den, two bathrooms and a large lanai. At 1,400 square feet, the condo fits within ASID parameters for a small residence, defined as one measuring 1,500 square feet or less. Watkins' client often ate away from home and, as a result, didn't own a dining room set, conserving space. Watkins encouraged her client to use her patio for meals at home, and urged her to eat on the lanai at a full-size table; new storage space came by way of built-in cabinets and custom bookcases. Free-standing pieces such as a thin, glass-front cabinet and a Chinese altar table were also introduced: The altar table was a cost-effective stand-in for drawers, an omission in the original kitchen design. Watkins unified the interior by using black accents throughout the home, as well as pine wood wall coverings and flooring. She also employed a sophisticated color scheme throughout with a hierarchy of colors, using a dominant color such as a bold red hue and supporting colors such as cerulean. An avid horse rider, the client agreed to turn the underused den into a tack room, an unusual feature for Watkins. "I've never even been on a horse," she said. "I'm not designing for myself. I'm designing for my client." Before her intervention, more than a half-dozen horse saddles lay scattered about. W Interiors took home two ASID awards for the Kuikawa residence: a merit award for single space and an award of honor for large residence. Although they have worked on a number of commercial projects, Big Island design firm W Interiors has become synonymous with luxury residencies. 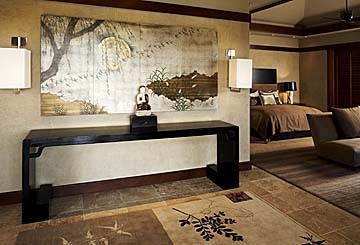 For the second year in a row, New Zealand native Gina Willman has won the ASID Large Residence Award of Honor. 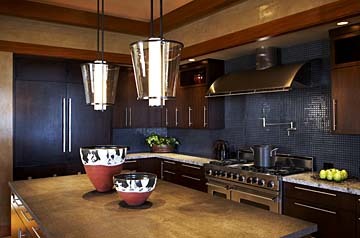 She submitted her design for the 2007 awards because the home was a "show stopper." At 11,000 square feet, the primary residence for a Hualalai couple is triple the size of most large homes, which ASID defines as upward of 3,500 square feet. "It's just a dream project," said Willman of the compound, which includes four bedrooms, four full baths, four half-baths and a media room. The Kohala Coast residence consists of a series of Balinese-style pods. Other homes designed for the family by W Interiors had a Hawaiian flair; this time the family wanted an Asian/contemporary-themed home, which Willman incorporated into the project she calls "East Meets West." The home is characterized by a mostly neutral palette, travertine floors and two-tone mahogany millwork. Involved in the 18-month project from the ground up, Willman also played upon the opposing characteristics of public and private while designing the interior. The master bedroom and bathroom suite is set at the far end of the complex, a retreat for the owners when solitude is needed. But the family also enjoys music and socializing. An outdoor entertainment area accommodating both is easily the home's most outstanding feature. 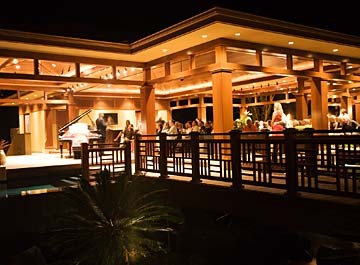 Multiple parties have been held in the entertainment pavilion, which comfortably holds 100. Lightweight furniture is changed out depending on the event; classical concerts and small rock shows have been held on property. "There's so many wonderful outdoor spaces," said Willman.